Journey Of A Frontman recently conducted an interview with FOZZY singer and WWE wrestling superstar Chris Jericho. A couple of excerpts from the chat follow below. Journey Of A Frontman: How do you feel [FOZZY guitarist Rich Ward] influences you? 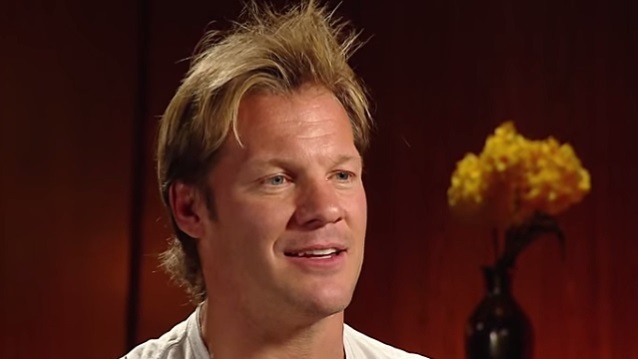 Chris Jericho: Well, we've been working together for so long. I've learned a lot about music from Rich as far as phrasing for lyrics. He writes all the melodies for FOZZY and he knows exactly where my voice sounds best and what notes I would hit best. So I think rather than an influence, it's more of a partnership. We kind of really work in tandem for everything that FOZZY does. Recording, that's more his thing. Promotion is more my thing. Choosing what tours we accept, we think of that together. That's the secret of being in band; there's the songs and the music and that sort of thing, but the secret is more being able to get along and do a little bit of the give-and-take. It's a good team. If you're gonna win the Stanley Cup, you've got a guy that's the main goalscorer, you've got a guy who's killing penalties, and both of them have to know and respect the other person's role in their team to win the game. That's what we've figured out over the years, how to do that. Journey Of A Frontman: With a live show, what's the secret to being a good frontman? Chris Jericho: Just a connection with the crowd. People want to have a good time when they come to a show and you have to do everything you can to let them know that it's okay to have a good time. Some crowds are easier, some crowds are harder, but you have to go the extra mile to get those people to open up and realize that they're there to have fun. So it's all about the connection, man. It's the same whether it's a FOZZY show or a WWE show, you have to have that connection with the crowd. And when you get that, they're gonna be more into what you're doing. Journey Of A Frontman: Who are some of your favorite modern-day frontmen? Chris Jericho: I think M. Shadows [AVENGED SEVENFOLD] is a great frontman, he does a great job. Corey Taylor's [SLIPKNOT, STONE SOUR] a very good frontman, he's not afraid to go the extra mile to get people excited and into what's going on onstage. The basic tricks of a frontman all boil down to David Lee Roth [VAN HALEN], Paul Stanley [KISS], Mick Jagger [THE ROLLING STONES] and Freddie Mercury [QUEEN]. It's the same concept. Like I said, not being afraid to be yourself and to go out there and just have a good time, man. And when you have a good time, it rubs off on the crowd. So then they feel the same way. As a frontman, you set the tone for the rest of the show. You set the tone for the vibe of the audience. If you're kinda a laid-back type of guy fronting a band, that's probably the type of reaction you're gonna get. But there's some people, that's what they want. Not for us. We want people to go nuts. We want people to chant, "Hey! Hey! Hey 1! 2! 3! ", and just throw their hands in the air. That's what we want. We've gotta put on a show. Read the entire interview at Journey Of A Frontman.